As an atheist who has chosen not to have children, I am used to hearing things like, "But you are exactly the sort of person who should be having kids." I understand that this is a compliment, and that's the way I try to take it. Still, I find that it gets tiresome after a while. I have never had any interest in having children, and I'm about as confident as anyone could be that this is not going to change. I think we can generally agree that someone who does not want kids, does not particularly enjoy spending time with children, and does not envy the lives of his friends with children probably isn't the sort of person who should have kids of his own. 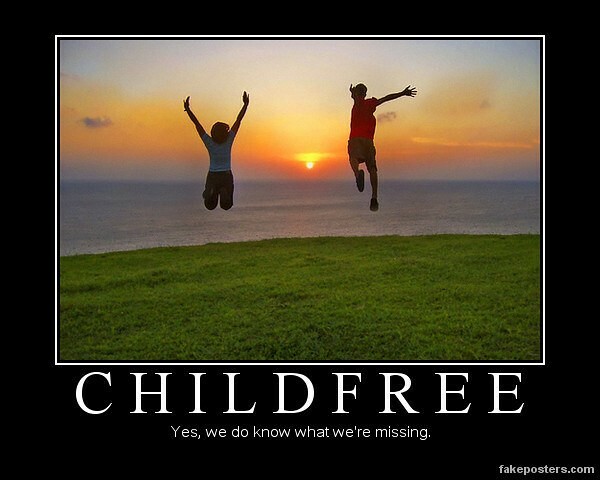 This is why it was so nice to see a post by Godless Girl titled "Why I'm Childfree" (update: blog no longer active). Not only did she do an outstanding job of clearly expressing her reasons for choosing not to have children, but she provided some helpful tips for those who have a childfree friend or family member. Like Godless Girl, I am not interested in being pitied because I have made this choice. Parents are certainly right that I am missing out on certain experiences. There is no question about that. But I am doing so because I am not interested in having these experiences. Like Godless Girl, I am not particularly receptive to the idea that my decision is selfish in some way. Wouldn't it be even more selfish to bring unwanted children into the world to serve some other purpose? But shouldn't atheists have more kids to ensure that the future isn't dominated by legions of brainwashed Christians? Maybe in some highly abstract way, I can see the merit to such a suggestion. Still, I'm not sure we need more children with a parent who is not particularly interested in having them around. I'd prefer to contribute to the atheist movement in other ways. And for those who say that they didn't want (or like) children either until they had their first, I do not doubt your experience. It is just that I think that I probably know myself well enough by now to know that this would not be my experience. While I cannot be absolutely certain that something like this would not happen to me, all the evidence I have says that it would not.